If you’ve got money, don’t hesitate to buy a septic tank riser for your septic system. It’s not in any way going to increase the volume capacity of your septic tank, but I am sure it can save you money in the future. If repair or maintenance does not happen in your lifetime, sure it can happen in your children’s. Besides, if you will be selling the house to live in another house, you can have it at a higher price courtesy of the presence of a riser. These are the three different material used in making risers. They differ in durability, ease of installation and of course, price. The hardest one to install is concrete because of its weight, but it is the cheapest. PVC risers are the lightest of them all, but they are the most expensive. Cement risers are the least durable of them all because water and soil erosion can easily damage the structure. Polyethylene risers resist soil erosion but are susceptible to gas and water leakage. PVC, being the most expensive, is resistant to soil erosion and leakage. The main purpose of having a riser is to extend the lid of the entire septic system upwards. Ultimately, the goal is to make the lid easily accessible for cleaning maintenance or repair by craftsmen or septic tank technicians. That is why a riser is also called a septic tank access riser. Now, improving accessibility can greatly reduce the cost when you need to call in company cleaning service or to have the septic tank emptied. This is where you can recover the cost of installing a riser. Why? 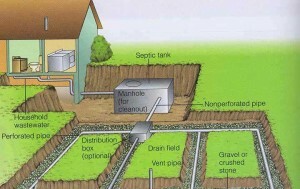 Usually, septic tank repair and cleaning companies charge customers for locating the septic tank and digging into the earth to find it. So, don’t rely on the prices that they are indicating in their advertisements. They just make it appear that the price is low. When they start digging, they begin adding up to the cost. If you have a riser installed, you know exactly where to point them, and therefore companies’ hands are tied to the original price. Septic Tank Riser Cover – How Can It Help Save Money? This has nothing to do with maintenance cost. I am talking here about ensuring the health safety of your family. Since you are, in effect, raising the septic tank’s lid closer up above, you have to ensure that the riser wouldn’t leak to let out harmful gases and bacteria. Bacteria can easily get mixed with air and be flown inside the house. Gases leaking out may or may not smell so you wouldn’t know if they are coming from the septic tank. This is a very important advice: get a riser that won’t slip in the lid and make sure that the septic tank will not overflow. I cannot tell you about details about prices of septic tank risers, but companies usually have listings of them. If you don’t trust company pricing listings, read reviews that tackle on the matter. Copyright © 2019 Septic Tank | Sitemap. All rights reserved.